Marketing strategies have evolved over the years. The internet has been instrumental in shaping human interaction around the world, in a manner not seen before. With the world population at about 7.6 billion and the online community at 4.021 billion, having a system in place to take inventory has been of the essence. The social media scene has provided an excellent platform for information dissemination. It’s no wonder that businesses have been keen to study trends. All in a bit to get the best out of various demographics in terms of promoting buyer habits. For marketers, staying up to date with the latest social media statistics is absolutely important. 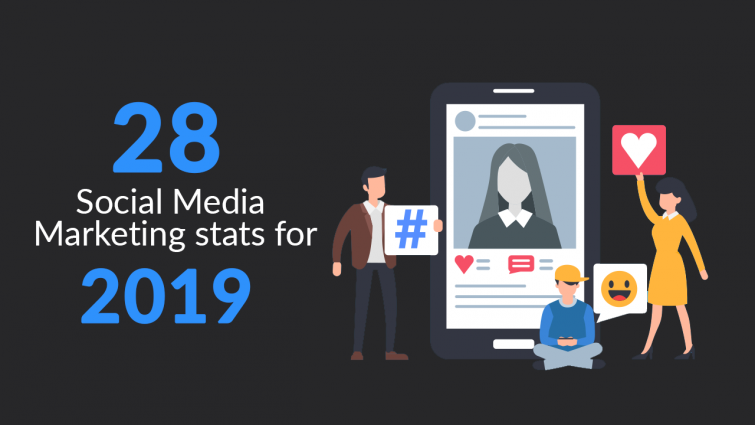 In our analysis today, we’ll be reviewing the top 28 social media marketing statistics. This compilation should be able to bring you up to speed with the happenings that are shaping our lives on a daily basis. 1 – Estimates show that about 48 percent of Americans have networked with brands on at least one social media site. With this figure representing almost half the American population, it’s not to see why the social media scene has intrigued marketers. 2 – About 90% of marketers have confessed to the fact that social media has played a massive role in helping enhance their business exposure. 75% of this same crowd point to social media as being the reason for their increased traffic. 3 – 81% of SMBs (Small and Medium Businesses) have active social media pages. 4 – 43% of online stores receive a substantial amount of traffic from their social accounts. 5 – Research shows that about 51% of Americans on online platforms admitted to unfollowing/reporting social media pages they found repulsive. 6 – Nearly 91% of social media users access their social channels through mobile phones. 7 – The numbers show that 52% of social media marketers admit to having experienced challenges when reviewing ROI (Return on Investment). 8 – Research conducted by Smart Insights and Clutch has shown that social media content has varied popularity rankings. When it comes to engagement levels, articles are responsible for 27%, images 24% and videos 26%. 1 – The average Facebook user has at least 155 friends. While this number may vary from individual to the next, research has shown that this figure represents a communal outlook. A study by Oxford University has shown that despite the bloated numbers, the best way to maintain close contacts is via face-to-face contact. The study showed that having many friends is ideal for social media marketing statistics, but bad for maintaining steady relationships. 3 – Facebook stats show that about 87% of people online aged 18-29 actively engage on Facebook. A recent report showed that about 2 million young people under the age of 25 will quit the social network in 2018. 4 – Incredibly, a large number of college graduates are active on Facebook. With the Facebook stats showing about 74 percent of graduates on the platform. Experts believe Facebooks “teen problem” has been caused by the emergence of new social media platforms that are more interactive. 5 – A significant portion of the world population, 22% use Facebook as their favored social media channel. Many people, especially the elderly, find the platform easy to use and a solid source of news and entertainment. 1 – Astonishingly, Twitter stats recorded about $575 million in advertising revenue from the 1st Quarter in 2018. 2 – The engagement levels of Twitter ads have skyrocketed by 69% since 2017. 3 – In the 1st Quarter of 2018, Twitter stats show that video is responsible for more than 50% of Twitter’s net ad revenue. 4 – About 79% of Twitter accounts are situated outside the United States. Remarkably, the top three countries are Brazil with nearly 28 million users, Japan with 26 million users and Mexico with 24 million users. 5 – The most popular emoji on Twitter is “Tears of Joy”. The emoji is found in about 5 billion tweets. Ever since their conception 1999 by Shigetaka Kurita in Japan, emojis have been on the rise. Many believe that they’ve become so widespread because they carry an emotional weight that can’t be conveyed using just plain text. Marketers looking to appeal to the intrinsic emotional state of their target audience can use emojis to cover more ground. 1 – The professional social networking company has notched about 500 million members. The impressive numbers are further enhanced by the fact that the company is well represented throughout the globe, with users from 200 countries. 2 – LinkedIn actively has about 10 million jobs listed for users to peruse through in the “Jobs” section. 3 – LinkedIn stats show that on average, Chief Executive Officers on the platform tend to have at least 930 LinkedIn connection. 4 – When it comes to establishment, LinkedIn stats show that more than 3 million companies have LinkedIn accounts. 5 – Of all LinkedIn stats, the most surprising is the fact that the social network is the only one in the world where both males and females are equally represented.